A creamy No Bake Pumpkin Cheesecake served on top of a Gingersnap Cookie Pecan Crust will be sure to wow your guests this Holiday Season! Do you ever feel like you have to keep up with the “standards” that society places on you? You need to look at certain way, dress a certain way, act a certain way. Your life must look a certain way from the outside. Your kids need to act a certain way. They need to be at “this level” by the age of 1, 2, 3, or 4 and if they aren’t something is wrong with them. The list goes on and on. Potty training! Society says that children should be trained around the age over 2 or so. Guys… it is hard stuff. Personally I am so over changing horribly smelly dirty diapers and ready for my little man to be potty trained. But he is just having nothing to do with it, in fact he cries at the idea of sitting on the potty. He is a little over 2 1/2 and I am definitely feeling the pressure from society that he should be potty trained. While I was in Chicago this past week, I was talking to a new friend Kellie from The Suburban Soapbox and she was telling me not to put pressure on myself. Some children are potty trained before they are two and some are when they turn four. Everyone is different and your can’t force it, if you do you and your child will be miserable. So.. I’m going to go with the flow and take my cues from little man and let HIM tell me when he’s ready. Something I will not being taking cues on from little man is cooking. If that was the case we would end up with scrambled eggs and cookies all the time! 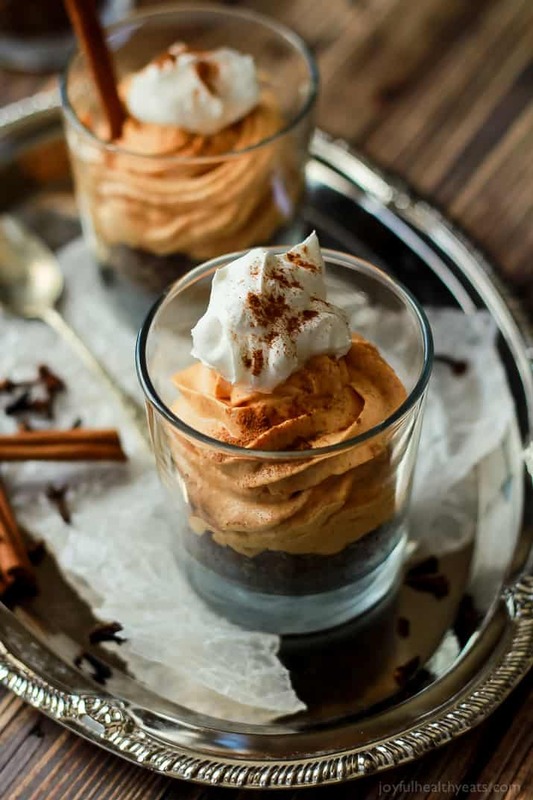 So keeping that in mind, today we are diving headfirst into pumpkin land again with this No Bake Pumpkin Cheesecake with a Gingersnap Pecan Crust. The Gingersnap Crust of this dish totally rocks, its buttery, slightly spicy from the ginger cookies, and then nutty from the pecans. The flavors in the crust go perfectly with the creamy fall spiced Pumpkin Cheesecake. The crust is crunchy while the cheesecake is light and airy, it’s the ultimate pumpkin bite! 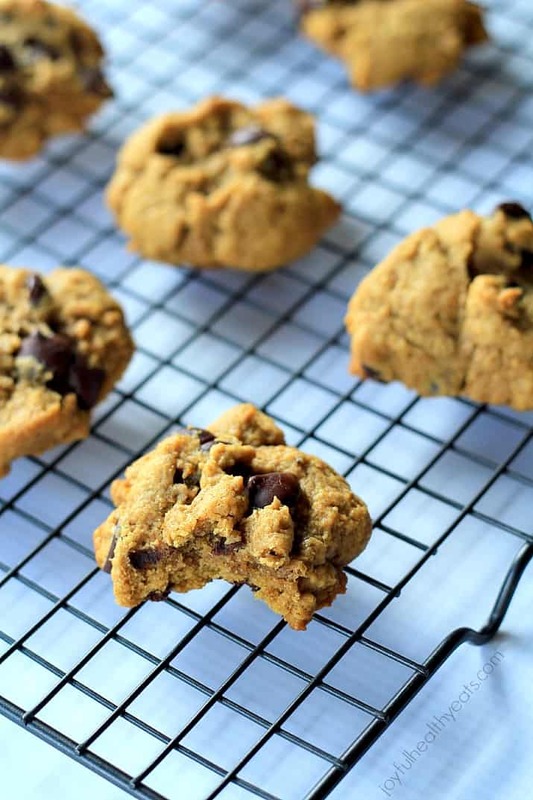 Add gingersnap cookies and pecans to a food processor, chop until turned to powder. Pour into a small bowl and add melted butter. Mix till a moist crust is formed. 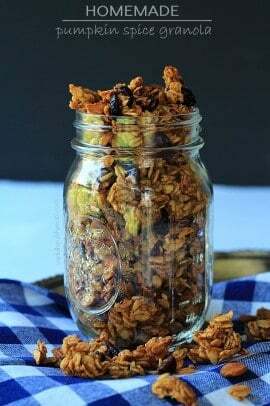 Add 2-3 tablespoons of gingersnap pecan mixture into a serving cup. Pat down. 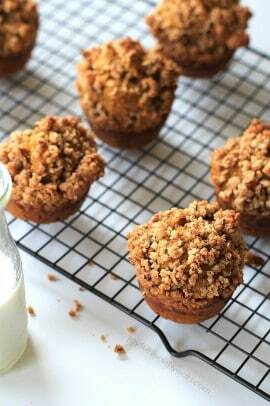 Place serving cups in the refrigerator for 1 hour to let crust harden a little. In a medium bowl, add softened cream cheese, pumpkin puree, sugar, vanilla extract, cinnamon, ground ginger, ground nutmeg, ground cloves. Using a hand mixer, combine until mixture is smooth. Gently fold in the lite cool whip. Let sit in refrigerator for 1 hour. Using a large pastry bag with a large tip squeeze about 1/2-3/4 cup of pumpkin cheese mixture over the crust. Top with a dollop of cool whip. haha.. so true Christina… girls are definitely easier! Boys just like to be “dirty” it doesn’t really bother any them… but I can’t handle the smell anymore!!! Unfortunately, I can’t sympathize with the potty training, as I don’t have kids. BUT I can eat ALL of these gorgeous mini bites! GIRL, these photos are beautiful! And I totally have that plate! Pinned! haha… eating these pumpkin cheesecakes easily wins over potty training any day!! Thanks for the pinning sweet friend! 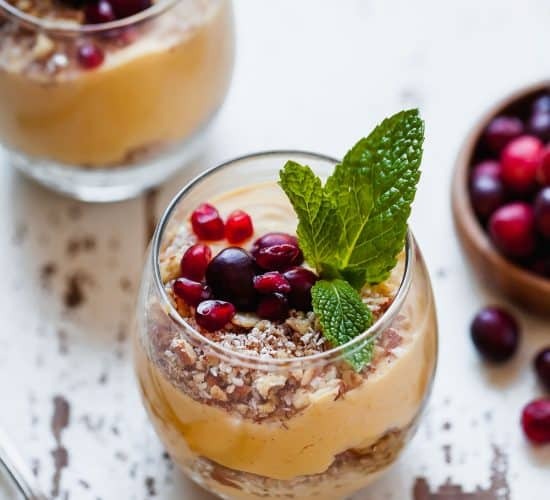 I always love a no bake dessert and these look incredible! I’m drooling over that pecan crust! I just started with them and am officially addicted! These look so delicious and your pictures are gorgeous. I completely agree about the potty training. My 3 1/2 year old is starting to get it, but is having a hard time. I can’t wait to finally not have to change his diapers anymore! Thanks for the sweet comments Alyssa and for the encouragement … its good to know I’m not alone! I have potty trained 4 kids and let me tell you… they will do it (and it will be SOOOO easy) when they are ready. It’s hard and if you try to force it it’s going to stress them out and stress you out! 2 seems really early to me as a “standard” age. I think you can give yourself until 3 before you start to feel any ounce of pressure for him! Even then, he’ll totally do it when he’s ready! Yes!!! I have definitely been stressed out about it and can tell it gets him stressed. He’s gotten to the point of crying if I ask him if he wants to go “poopu on the potty”. Ugh… can they just be interested already!!! These smelly diapers and the COST is driving me crazy! But these cheesecakes are too die for! No bake..you are speaking my language! Hope you get a chance to try these bad boys… they are life changing! These look amazing! 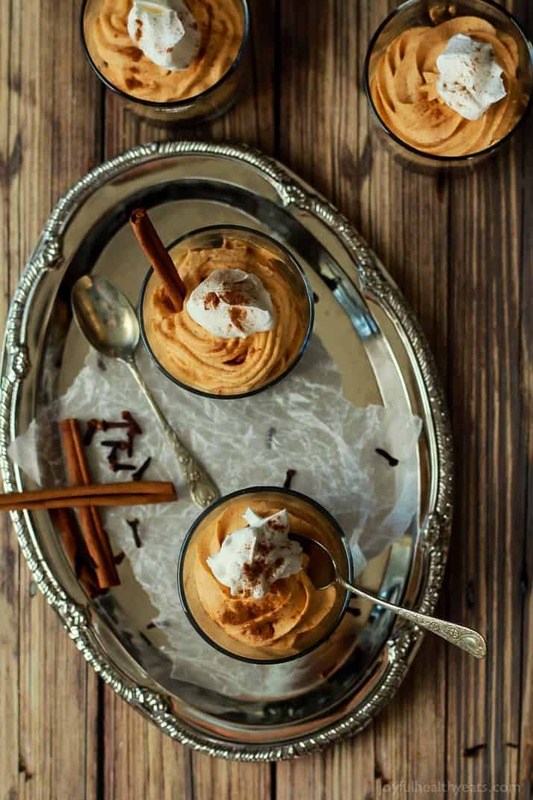 I’ve been craving a pumpkin dessert and this may be it! It’s so simple and that crust looks amazing! I love gingersnaps! And yes…let him tell you or else you’re going to be miserable and it will take so much longer. Oh girl this is totally it! 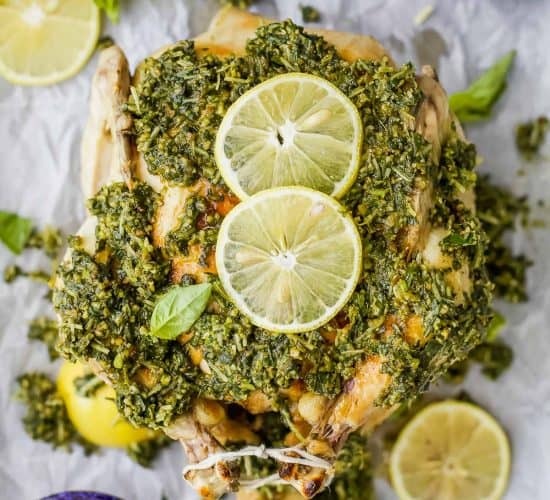 It is so easy to make and so light and delicious! Thanks for the encouragement on the potty training girl! I can’t wait to make this! Sounds so easy and wonderful! Thanks! These photos are straight up GORGEOUS! Plus I want this cheesecake in my belly! Definitely up my alley. I love that they are lower calories so I can have my pumpkin fix and not worry too much about my jeans fitting the next day. :). Pinned! 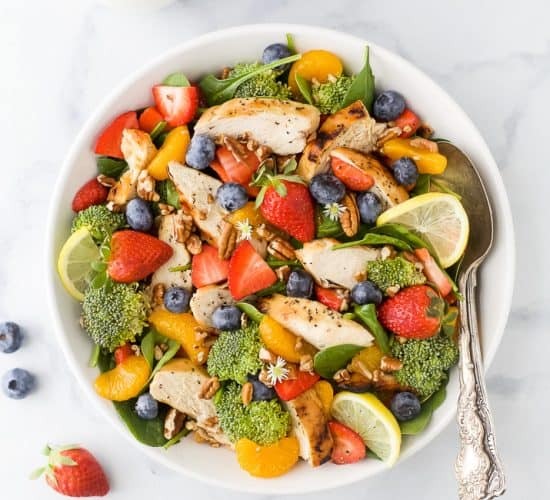 This looks so light and refreshing. 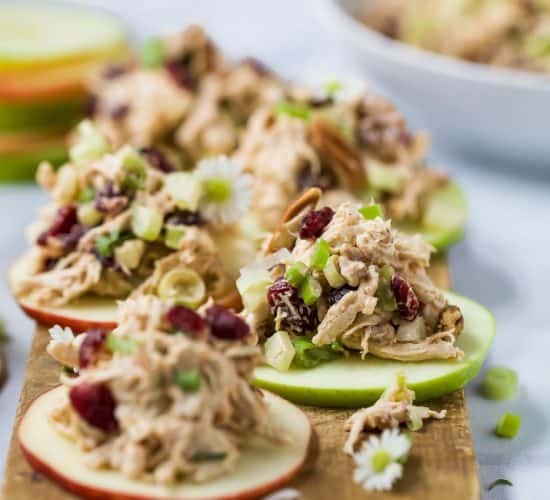 Such a perfectly simple yet stunning treat recipe for Thanksgiving! 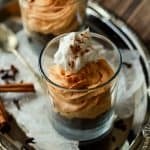 37 Decedent and Unique Pumpkin Recipes for Fall! Came out really good! I sprinkled chocolate sprinkles, cinnamon and cocoa powder on top and served it out of a big dish instead of individual dessert cups.. I made it with whipped topping mix instead of cool whip and light cream cheese.. Came out very tasty and not too sweet which is the best part. Easy. Recommend it 🙂 Filling was light and fluffy yet delicate and flavourful. Could use any cookie as base as well..